According to the Transparency International Corruption Perceptions Index 2017, Estonia is the 21st least corrupt country in the world. Estonia has improved its rank by one spot compared with the 2016 index, having this year scored 71 point out of a hundred (compared with 70 points last year). Transparency International gives every country in the index a score of 0-100, where 100 means “very clean”. No country in the world, however, gets the perfect score. 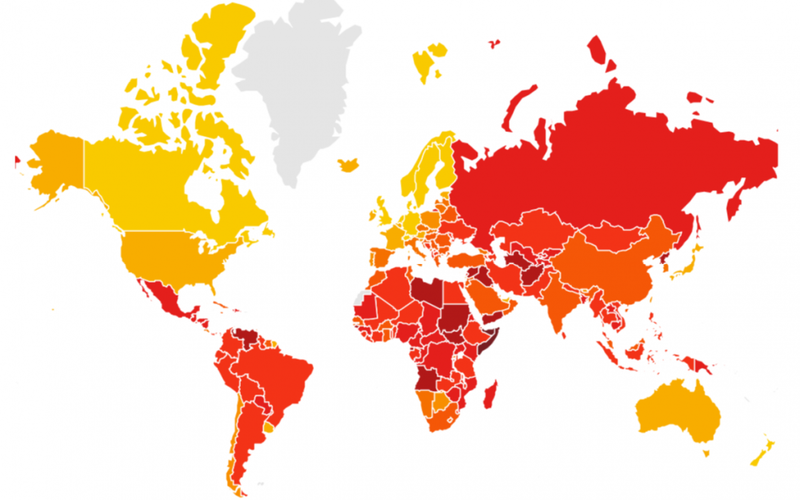 The least corrupt country in the world is New Zealand with the score of 89, followed by Denmark (88) and Finland (85). Finland, however well it is ranked is, according to Transparency, “one of the most worrying cases in Western Europe”. The 2017 index ranks 180 countries in the world. The most corrupt countries in the world are Somalia (scored 9), South Sudan (12) and Syria (14). Transparency also said that this year’s index reveals some disturbing information – “despite attempts to combat corruption around the world, the majority of countries are moving too slowly in their efforts”. When we take a look at Estonia’s neighbours, then Lithuania is ranked 38th (scored 59) and Latvia is ranked 39th (58). Russia can be found in the “highly corrupt” column with the score of 29, which ranks it 135th. Transparency International is an international non-governmental organisation, based in Berlin, Germany. Its non-profit purpose is to combat corruption and prevent criminal activities arising from corruption. Cover: The global map of Transparency International Corruption Perceptions Index.